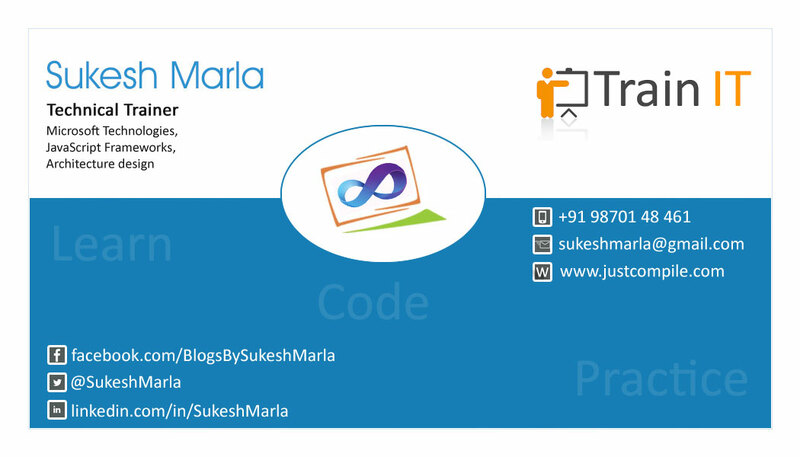 MVC, WCF, Design Patterns, MSBI, JSON, jQuery,Fundamentals..
Share your feedbacks . Don't forget to specify the topic you learned. I enjoyed attending wonderfully planned training sessions for MVC from sukesh sir which were very knowledgeable. Trainings imparted were easy to understand and quite useful, best part I liked that sukesh sir used to explain using examples which made tough topics quite easy. Hope to attend more session soon on other topics too. Was a pleasure attending training from sukesh. His practical approach towards architecture helps applying concepts in real world. Through his help I am able to understand and participate better in architectural decisions of my project. Sukesh is extremely helpful and I really enjoyed working through the course. I am very satisfied and would recommend the course to anyone wishing to learn online.His practical approach about the course help to understand the concept better. Sukesh is one of the good trainer, I ever had training with. Getting with the basics, he makes sure you understand the concept of the technology in which you are getting trained. Very good in problem solving, provides solution very fast. I will recommend Sukesh to everyone. Sukesh is a good trainer. He has very good conceptual knowledge and great expression skill. He waits and teaches with patience till you understand . Defenetli recommend Sukesh any day.